The crispness of the fall air and cooking… somehow the two seem to go hand-in-hand. Maybe it’s the rich, hearty scents of pumpkin, apple, squash, soups and casseroles that make me long to be in the kitchen. Or the comfort these foods bring us. Maybe it’s that cooking warms the heart and home and it’s the warm hug we need as the weather turns brisk. All I can say is the delectable aroma of this acorn squash soup flooded our home and is a fabulous way to welcome fall. Yup, those seeds from those three acorn squash made a surprise visit with it’s long vines and beautiful yellow flowers… and a whole bunch of squash! So when life (or compost) gives you squash, what’s a girl to do? Make soup! Oddly enough, only a few months before we knew we were squash farmers, we had dined out for dinner and I tried a creamy squash soup for the first time. And I actually really liked it. Which came in really handy seeing that all the squash ripened about the same time. And my non-squash lovin’ family was not thrilled about the idea of consuming that much squash that many times. So I needed to do something that would be easy to make, wouldn’t take up a lot of room, and that I could freeze. Hence my recreation of Acorn Squash Soup! This soup is actually one of my favorites. It is so creamy, rich, filling, and healthy… and I crave it! Give it a chance. You may think the hidden ingredients will be odd… trust me, they’re not! You’d never know they’re in there! So, the secret is that this soup is all natural and loaded with veggies! 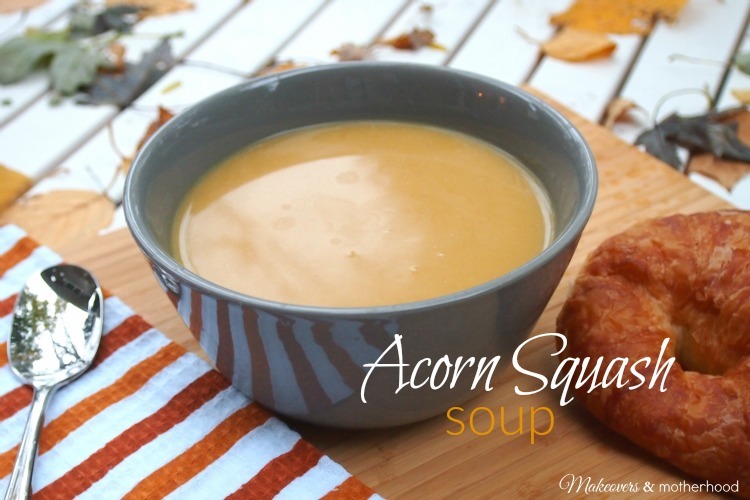 The pureed acorn squash and cauliflower gives the soup a perfect creamy consistency without adding any heavy creams. And… it’s twice the veggies without even a hint of cauliflower! Hold on while pat myself on the back for this one. Yah, I might be awesome! If you are a freezer meal kinda gal, this soup is perfect! One batch serves six people with no sides. Serve a croissant or a half sandwich and now you’ve doubled your soup servings. An all natural, delicious dish of soup with a hidden veggie! Cut the squash in half lengthwise, very carefully piercing the middle with a sharp knife. The skin is quite tough, so move slowly so the squash doesn't roll. Scoop out seeds and stringy membrane. Bake for 40 minutes or until the squash is soft. Let cool. In a small pan, melt the butter. Add garlic and onion. Cook for a few minutes, until onions are soft. Add butter, garlic and onion mixture to the cauliflower and puree. In a large soup pot over medium heat, add the pureed mixture and 4 cups of chicken stock. Stir. When the squash has finished baking, spoon the fleshy insides into the food processor. Puree (once again making sure it is nice and thin). Add pureed squash to the pot. Stir well. Add Cayenne Pepper and salt (if desired) to the pot. Stir and bring to a simmer. Cook for 15 minutes. Ladle into soup bowls and garnish with a dash of cayenne pepper or dillweed, or a swirl of sour cream.